As I've mentioned before, my job takes me to some interesting places in Arizona. Last week, one of those places was Lake Havasu City, where I spent a night in between assignments for the magazine. 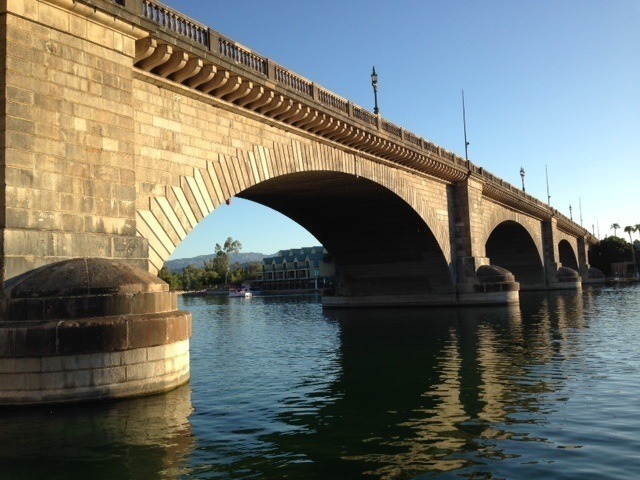 If you've never been to Lake Havasu City, you might not know that the town's centerpiece is London Bridge, which came over from England nearly half a century ago. And you might have some questions about that. Here are some answers. Is this the original London Bridge? Well, let's go back to 1831, when London Bridge was completed over the River Thames (in London). It actually replaced another London Bridge that dated to the 12th century. The new bridge carried traffic until the 1960s, when the weight of modern cars became too much for it to bear and it began to sink into the Thames. The city of London sold it to Robert McCulloch, the founder of Lake Havasu City. McCulloch was a man of entrepreneurial talents. His greatest success came in the chain-saw industry, but he also ran ventures in oil and gas exploration, aviation and land development, among other pursuits. In 1963, he bought a 26-square-mile parcel of land on the shore of Lake Havasu. He opened a chain-saw manufacturing plant there to spur growth. So, what about the bridge? McCulloch was looking for an iconic attraction to spur interest in the town, which was (and still is) a fair distance from major roadways. He put in a bid on London Bridge, which London had decided to auction off instead of demolishing it. There wasn't much competition, and his bid of about $2.5 million was the winner. How did it get to Arizona? The disassembled bridge was put on a cargo ship and sailed through the Panama Canal to Long Beach, California. From there, it was trucked to Lake Havasu City. It was reassembled, piece by piece, and opened in October 1971. So, why did you say it's "sort of" the original London Bridge? The load-bearing elements of the bridge are a new structure, but the stonework from the original bridge was used to clad that structure. It's the original skin with a new skeleton, basically. Was there a need for a bridge in Lake Havasu City? No. At that time, what today is an island was a peninsula jutting into the lake. After the bridge was rebuilt, the city dredged a canal under the bridge, creating an island. Did the project pay off? Interest in buying land in Lake Havasu City increased after the bridge was completed, and McCulloch is reported to have recouped all the costs of buying and reassembling the bridge. Today, the city bills the bridge as "Arizona tourism's second-largest attraction, after the Grand Canyon." That may be a bit of an overstatement. How is the bridge doing today? It's not falling down, if that's what you're asking, but a traffic accident last year damaged a section of the bridge. It's been repaired, though, and a variety of special events and festivals are held on and around the bridge every year. Also, several hundred bats inhabit the nooks and crannies of the bridge. For more interesting facts about the bridge, click here. I loved seeing the Bridge in all its glory a few years ago. It definitely is something not to be missed. The first time I explored the bridge I think I saw many small damaged spots that might have been damage from the German air raids in WW2. In later years it looked like the spots were filled in. I thought the war damage added to the rich history of London. Does anyone know the full story about this ? I went to Havasu City in the very early 1970's as a child for a visit, it had always been in my mind to visit again, which I did so in 2013, it was like a homecoming for me. the original bridge had one more arch. Mr McCulloch saved the extra arch for spare parts. All the little crumb-lets were collected and glues onto a small square and sold as souvenirs. I forget what year it was (198?) but enough were sold to pay for the purchase, moving and re assemble of the bridge. I WAS VERY DISMAYED TO SEE THAT THE LONDON BRIDGE STOOD THERE ALL ALONE AND THAT THE ENGLISH VILLAGE WAS ALMOST GONE WITH PERHAPS TWO PLACES OPEN. THERE WAS NOTHING TO DO THERE...WE GOT BACK ON THE BOAT AND WENT BACK TO LAUGHLIN...SAD TO SEE NO VILLAGE LEFT....WHERE AND WHY?